Leaving a small chip or crack on your windshield for any amount of time is a bad choice, as a small imperfection can render your windshield beyond repair over night. Getting a truck windshield repair done promptly will restore your windshield to its original strength. It can also be a huge savings! Repairing a windshield is far more affordable than replacing an entire windshield. A chip can, in some cases, be repaired at no charge to you through your insurance. Please check with your insurance company to see if your policy will cover a truck windshield repair. Less down time – windshield repairs can be treated as if no damage occurred as soon as the repair is done! 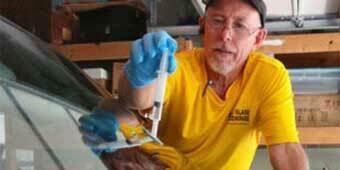 Our technicians at Auto Glass Warehouse offer expert mobile service to all clientele. We will gladly do your repair where ever your truck may be. 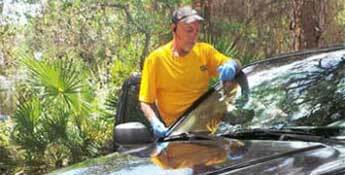 Every one of our technicians is highly trained in windshield repairs. Your satisfaction is guaranteed on every repair. Please be advised that although a truck windshield repair will restore your windshield to it previous condition, it is still possible that a slight blemish can be seen due to contaminated in the air and on the windshield. Our staff strives to make your appointments with our company as easy as it can be. We always have your glass ordered as soon as possible and provide you with competitive pricing. If you will be placing an insurance claim, there is no need to call your insurance company first, as we will set up the claim through a fast and easy conference call to your age ncy. We do require your presence on the conference call to confirm with your agent that you would like to use the Auto Glass Warehouse for your truck windshield repair. Rest assured, this conference will only take a moment or two or your time. There is no guess work with the Auto Glass Warehouse since we are approved for windshield repairs and replacements by ALL insurance agencies. If you should forget and talk to your insurance company first, please tell them you are selecting the Auto Glass Warehouse to service your repair. You have the right to choose the company you would like, even if your insurance company suggests using a 800 claims service. Although we are in the 800 claims service, the auto glass company that receives your work order is chosen at random from a rotation of companies within the service. If you do need your truck windshield repaired, contact one of our local offices today.